After our January visit and letters of complaint we were given a voucher to use at the restaurant. The general manager was fired and the new manager, Kyle, is someone we have known for over 15 years. I believe he can get the restaurant up to the standard the estate deserves. Due to the fact that Kyle is now working there, we took up the offer of the voucher and went back for dinner. Service was much improved but I cannot say for sure if this is due to everyone being aware of how we have been treated in the past. The meal was good but not excellent. If you happen to eat there please leave me a comment about your experience. Do not go there! Poor service continues to be a theme of The Millhouse Kitchen. On the 29th of January we went to dine at the restaurant with the same couple in the below review. In short, the service was diabolical, the manager could not care, and the food is average. The staff were not advised about menu specifications before dinner service started. The waiter did not care enough to clear the table despite being asked twice to do so. Finger bowls were provided only upon asking for them and came in water tumblers! And to add insult to injury, the waiter charged one couple the entire bill amount, and the other couple only half, taking a really nice tip for himself which we did not give him. 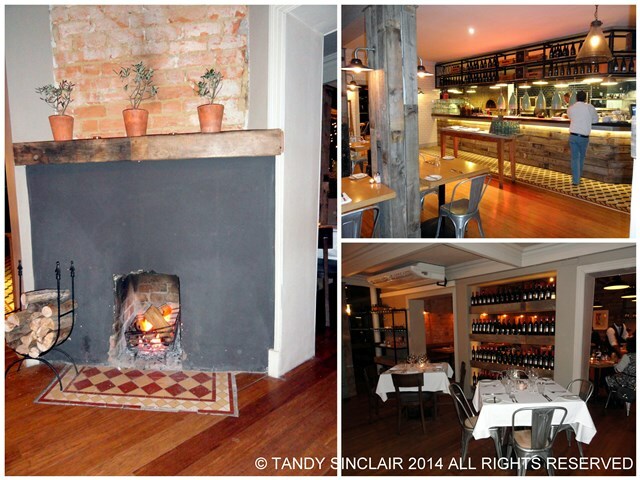 When The Millhouse Kitchen opened on the Lourensford wine estate Dave and I went to enjoy a meal. This was two years ago and little has changed. The menu which is rustic Italian with French influences, then and now is inspiring, and the food mostly good. When we went the first time I put the poor service down to them having only just opened, but after our experience on Saturday night this must be a result of lack of interest. The venue is wonderful and during the day you can sit outside and enjoy the amazing view. We sat close to the fire, within site of the open kitchen and far away from the pub area. The wine list consists only of Lourensford Wines which are available per glass or per bottle and are well priced to suit any pocket. We chose the River Garden Cabernet Sauvignon Merlot 2013 (R95). As soon as we ordered this our waiter informed us there were only 3 bottles available. I was not sure why a restaurant situated on a wine estate could not have stocked up before dinner service on the wines, and this was a theme to continue through the night. Our wine was brought to the table and Hans told the waiter he would not be having wine. However, the waiter could not have been listening as after Dave had tasted the wine, he poured for Hans. I took over that glass and Hans ordered a brandy and coke, and Kaz ordered a cocktail from the very good list of options. It took some time for her cocktail to arrive, and the waiter blamed the bar for the slow service. The wine is fruity and slightly dry with a lovely nose and a light hint of berries. There is also an excellent selection of single malt whisky’s which are well priced. Corkage is R35 / 750ml for wine and R50 / 750ml MCC and sparkling wine. 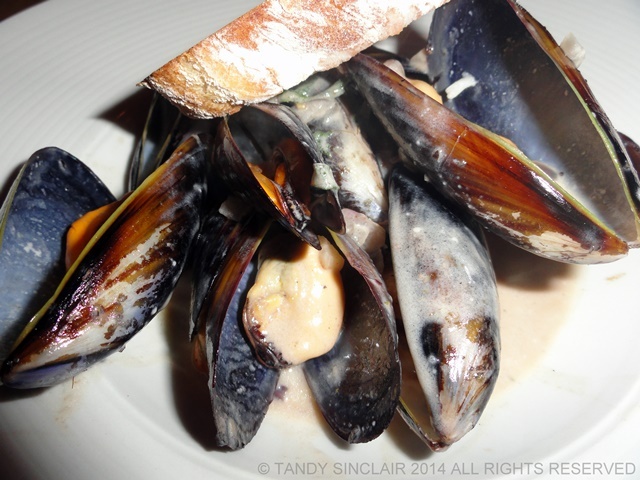 I ordered the mussels to start and these were served in a cider cream flavoured with oregano (R65). The 11 mussels were very flavourful and succulent. I was brought a bowl for the shells which was great attention to detail and I placed this bowl on the side plate. I was not sure why we had side plates and butter knives as we were not offered bread before our starters arrived. When the waiter cleared the starter plates he removed the side plates and we were under the impression bread was not on offer. However, we then saw the waiter bringing bread to other tables. When we asked why we had not received our bread he told us it was not ready from the kitchen before our starters arrived. However, when it was served it was cold! This means to me that he forgot. The bread on offer was focaccia with cheese, onion and tomato or ciabatta. Dave, Hans and Kaz each had a slice which was served with olive oil, balsamic vinegar and butter. 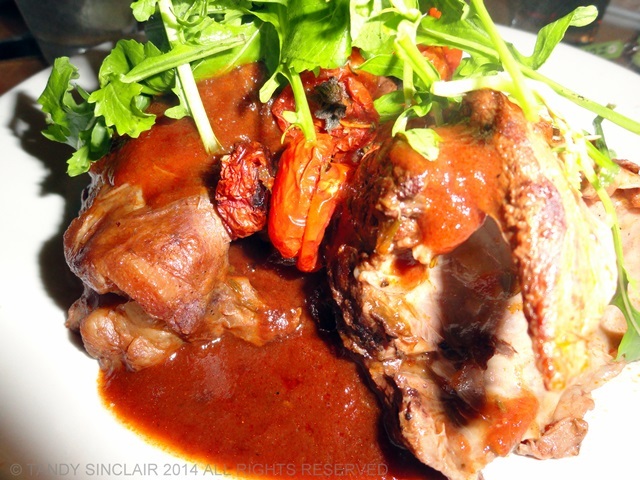 My main course was a slow cooked lamb shank (R135) that was served off the bone and was really dry. The buttered mash was bland and cold, and I am not sure if it was not heated or if the cold bowl had something to do with this. The slow roasted vegetables were really nice and I used all the sauce to moisten my meat. I left the potatoes after one forkful. Both my main course and starter could be considered ‘finger food’ but I was not offered a finger bowl after each course. I was quite impressed that the dessert menu included a gluten free option as well as a cheese board. I chose the crème brûlée which was excellent. There was a crunchy crack to the brûlée and the custard was smooth. It was served with biscotti and strawberries. Our waiter appeared to not know the menu when he told Hans that there was no hot chocolate on the menu. Maybe he meant to say there was none available as when we checked the menu it was there, and when we asked him he said that the restaurant had not ordered any! Dave ordered an espresso which finally arrived cold after all of our desserts. Once again the waiter shifted blame and said that he had watched them pour it but the cup was cold. Dave had seen the cup standing on the counter so we knew the waiter had forgotten to bring it. And frankly, if he had felt it was cold he should have asked for a new one to be made. Expect to pay an average per head of R123 for the main meal. The bad service resulted in a below average tip and I hope that this prompts the waiter to look at why he was not rewarded to the amount he expected to be. However, despite the food being excellent as far as everyone else at the table was concerned, I won’t be going back there in a rush. I love the frank and honest way you write your reviews, Tandy. There can be no excuse for bad service. 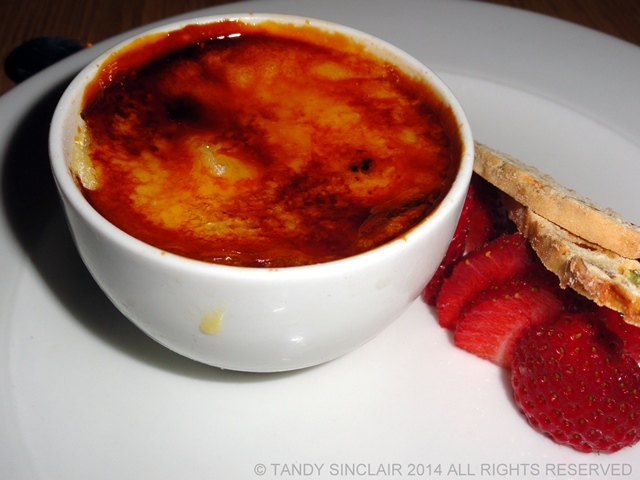 I hope the Créme Brulee sort of made up for the disappointing main course. Ouch…well, I guess one won’t know unless he experiences it himself. I had some of that, too. Thanks for sharing! It’s too bad this place was such a disappointment. At least it seems to have a cute rustic interior. Hi Tandy, sounds like it was a combination of poor service and management, somebody else should of been over seeing all the service and food. Sounds like there were some highs and lows to this place. The meal sounds like it could have been quite good if not for the ridiculously slovenly service of your waiter. Pretty much everything wrong with your meal might be put down directly to him, with the possible exception of the dry shank. If I were the owner or manager of such a place I’d want to know about the waiter’s lazy and insolent “service” and would put him on notice for firing if it happened again. What a waste of their resources. I’m glad you had good company, or it might have become a waste of your evening as well! While I appreciate true attention to detail in restaurants (like providing the missing finger bowls), I’m even more sure that the quality of regular, everyday things like promptness, honesty and attentiveness from the staff make the real difference in the experience. Too bad about the food. Shank is one of my favorites! Oh no! That’s so disappointing. We’ve been to Lourensford twice since moving here and love the coffee shop and wine tasting there. I’ve often wondered about the restaurant and assumed it would be out of this world. After reading this, I think we’ll rather stick to the coffee and wine. Service is everything in the service industry. I think I am very spoiled as living in Asia they are all about service. I was shocked on how attentive most staff are here in HK, Japan and Thailand. I will be spoiled if I ever leave Asia. I am glad your food was good but sorry the service spoiled your evening. Service should be excellent everywhere! Wow the service sounds like it’s a bit all over the place! What a shame as the food looks good. Bad service can really let a place down. It is a shame that such good food and a great menu was ruined by service! I hope your server learnt their lesson! Tandy, i really admire your in depth reviews and total honest opinions in these reviews. It is always disappointing when the service lets down a meal and you wonder why they are bothering with the job if they aren’t that interested. I am pleased to see here that there are some people who are making a career of front of house.